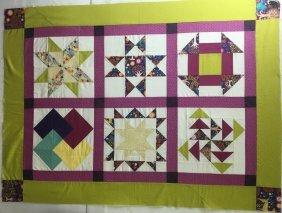 and review basic skills needed for piecing many different types of blocks. quilt or a wall hanging. Learning the basics is important in construction of precise blocks. The book we will be using is “You Can Quilt! Building Skills For Beginners”. intermediate students. The book is available at Quilterʼs Haven. Requirements: Basic sewing skills and a working sewing machine are required. Sewing machine in working order with new needles and 1/4" presser foot, if possible. You will also need straight pins, sharp fabric scissors, rotary cutter with sharp blade, rulers (12" x 6", 24" x 6" and/or square ruler, if you have one), cutting mat (a few are at the store) thread (neutral colors such as gray, beige, white or thread to match your fabric if you already have it), pen, pencil and pad of paper, marking pen-erasable (can purchase at the store). These are the basics. We will cover supplies and necessities on the first night of the class and I will share some rulers and mats also.